Our friendly and efficient office staff will assist you in scheduling an appointment that is most convenient for you. We respectfully request that you abide by our 24-hour cancellation policy if you are unable to keep your scheduled appointment so that we can accommodate other patients who need to be seen. We strive to be on time, but since the doctors may be called away unexpectedly or be required to deal with an emergent situation, there are times when you may be asked to wait. We will do our best to notify you of the delay, but we rarely have notice when these situations occur. International Unit　patients are given our doctors' mobile phone numbers. In case of an emergency, please call your doctor's mobile phone. Dept. of Maternal and Child Health at Aiiku Clinic offers health checkups for infants and children. Monday - Friday 9:00 A.M. - 13:00 P.M.
Monday - Friday: 8:30 A.M. - 11:00 A.M. and 12:30 P.M. - 15:00 P.M.
1st & 3rd Saturday: 8:30 A.M. - 11:00 A.M. 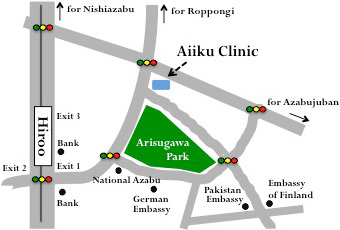 The Aiiku Clinic is conveniently located an 8-minute walk from Hiroo Station on the Tokyo Metro Hibiya Line (Exit 1). copyright©2015 AIIKU CLINIC.All rights reserved.